So what did I do with the other dough ball? I know, the suspense is palpable. You were sat on the floor of the living room in the deepest depths of despair crying "Please...please, why are you keeping this from me?? Why? What happened with the dough!!!!". I know, I've been there. Fear not, the answer is here. 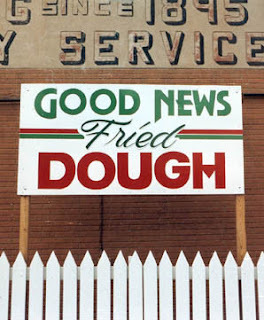 The last trip to the USA my in-laws properly acquainted me with the delights of fried dough. It's the kind of food that is typically served at fairs, carnivals and theme parks, that sort of thing. You can have sweet or savoury toppings on them, like sugar and cinnamon or tomato sauce and parmesan (both, FYI, are crazy tasty). It really is pretty self explanatory - its dough that's been fried. Since I had the other big dough ball I figured I'd attempt to make doughnuts out of it. So I made lots of little balls of dough and let them prove again overnight (not in the airing cupboard this time, just on the counter). When I went to make the doughnuts in the morning, however, the pizza dough had its own ideas. Pizza dough is quite a soft and sticky dough (which, by the way, keeps rising and rising and rising if you let it) so when I opened the container the dough had risen and spread but become incredibly soft. Just picking a ball up deflated it and set my plans for beautiful homemade doughnuts for breakfast (what an incredible wife) asunder. Not one to accept defeat I switched things up and figured I'd make fried dough instead. 1. Very simply, I half-filled a medium sized frying pan with vegetable oil (ideally you want enough so that the dough floats but please be careful not to fill the pan too high) and put it on a medium heat. You could, of course, use a deep fat fryer (mmm, I can feel my arteries clogging already). 2. I then teased the dough into discs. 3. Using little bits of dough to test the heat, once the oil was at the right temperature (it bubbled when I put the dough in) I carefully lowered a couple of bits of dough into the oil. Using a spatula and fork, after about 2 minutes (or until the immersed dough is golden - you can see the difference in colour on the edges of the dough) I flipped the dough over for another 2 minutes (or until the then immersed dough is golden). 4. I then set the dough aside on a plate covered with kitchen roll to drain some of the oil. choose how to apply it - I went with the sprinkle approach, you could go with the full on plunge (i.e. put the sugar and cinnamon in a dish and roll the dough around in the sugar until it's fully coated). 6. Fill your boots with sugary doughy goodness! Bon-app!